This is a very fun and entertaining craft for toddlers. My kids love to use glue, so in most of our crafts we use some glue to keep them interested. 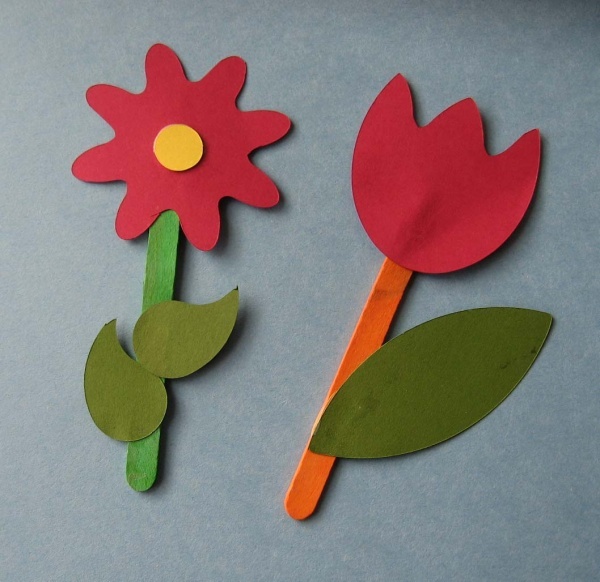 Before we start, I cut out colourful card stocks in to flower and leaf shapes. I use a paper plate for glue for them to share. Each gets a wood stick to apply the glue with and then there are sticks, and the shapes I already cut. To make it easy on them I make one of each flower and leave them with the material to go crazy. It is funny how they pick different leaves and different flower and come up with a totally new thing (sometimes flower J). This is quick, easy and clean (well except the glue part. I use washable glue J ) and my kids have lots of fun creating different flowers by picking different shape or glue it to some different spot. Previous article:Can you really trust the information sources on internet?? Good tip with using the wood stick to apply the glue! I am artistic contributor on http://www.kiddingabout.com so am always interested in what other people are doing! Hello! I am working with my father on his new arts and crafts website, http://www.looledo.com. The website is dedicated to connecting people with an interest in fun, kids crafts, science projects and more. It's an excellent resource for parents and teachers alike. If you'd be so kind as to take a look, we'd love to hear your comments. What a fun & easy craft!